Fire Engines Photos - Bedford/HCB Angus. Redditch retained WrT. Bedford/HCB Angus. Redditch retained WrT. Taken in 1984, she was on the run as the Water Tender 2, retained pump at stn. 27 Redditch, H&WFB. I 'think', it was the div. spare at the time, as Redditch had an 'F' series Dennis running as 274 normally. Great machine though! Any more info, be great to hear. ed: License plate TFK 265W. Cracking photo again Andy, I have a soft spot for the Bedford TK's. We had 2 brand new Bedford TK's, with HCB bodywork on our station when I joined the fire service. thanks for sharing. Added by Paul Warnock on 21 February 2011. Any body know about a Bedford TK Reg No BDV 191L. Added by Steve Toney on 21 February 2011. Great to see this fire engine again! I used to work at HCB Angus at the time she was built, as a sheet metal worker. 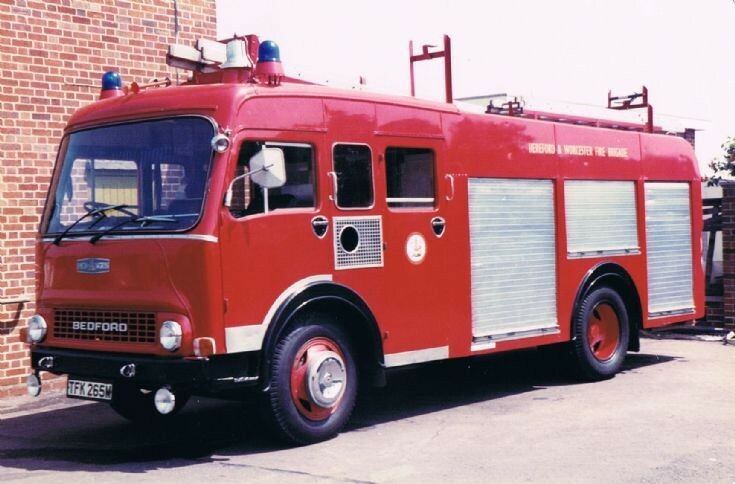 I remember doing jobs on these Bedfords, skinning doors, making the vents between the two front doors, ladder gantries, panelling the pump bays, making and fitting 'A'frames for towing hitches etc... great days, great memories. Added by Pete Hatcher on 20 January 2012. There's a slim possibility that this machine is still around. According to DVLA it was taxed until July 2007. Does anyone know if it's still around? Added by Matt Ireland on 21 January 2012. Hi Mat, I joind HCB in 1972 as a coppersmith and worked along side my brother Pete, a sheetmetal worker mainly on rear ends. We had a great time working on these units and our time there was a pure education. sad that is no more. I moved on in 1982. Added by Gordon A R Hatcher on 06 February 2012. Hi, I joined HCB in 1977 and served a 4 year apprenticeship. I remember Pete and Gordon Hatcher. I played for the firms football team that Gordon managed. Great times. Left in 84 . When applying for other jobs if you said you worked at HCB you had a good chance of getting the job. Added by William Goulding on 23 August 2014.